Reading week was my favorite week of the year when I was a teacher. I loved DEAR (drop everything and read) since it got my students to carry around their books and get excited about reading. The Dr. Seuss activities were so fun too, which I am now doing with my kiddos this week. You see Read Across America is exciting for me because I am a book worm. There is nothing I love more than getting engrossed in a book and staying up until 2am because I need to read just one.more.chapter. Of course the next day when I'm paying the piper I hate being such a book worm. I've yet to learn my lesson and I'm often exhausted from a wild night of reading. I love that our schools bring in authors to read to the kids and let them dress up as their favorite literary character. I'm convinced that it fosters the love of reading that I think all kids need. Yep, I think all kids need to develop a love of reading. I'd say adults too, but even I can acknowledge the lost cause that is my husband after 12 years. He will never learn to love reading. See opposites do attract. Once people learn that I am a recovering teacher, I often get this question over and over again. 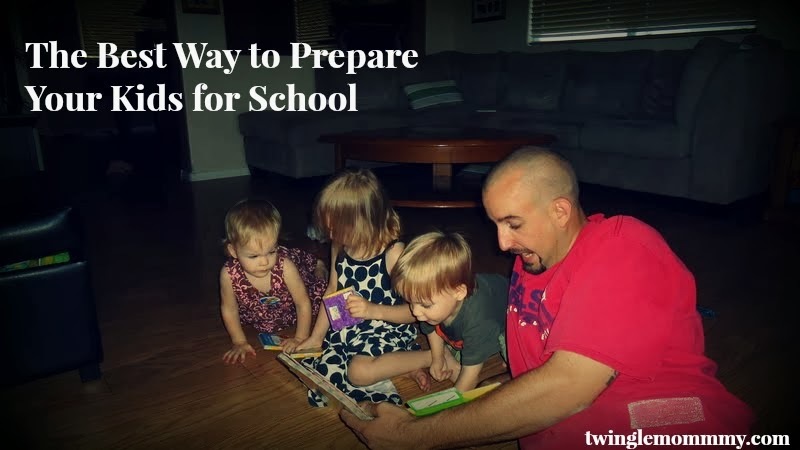 How can I prepare my child for school? There are so many answers to this question based on the individual child. I will tell you that Kindergarten teachers want kids who can follow directions, go to the bathroom on their own, eat lunch on their own, and recognize their name in print. But none of these things are as important as a child whose parents read to them. Yep, it's more important that you read to your kids than teach them their letter sounds. I'm sure that is surprising to many of you but there is no substitute to reading to your child. While your kids will learn many skills when you read to them, they will also begin to foster a love of reading. That it crucial for school success. A child who doesn't enjoy reading won't want to read. A child who doesn't want to read, won't unless forced. You can see the bad cycle forming here right? It's really easy when you think about it, you need to read to your child. That's it. I hope you feel better and less stressed about preparing your child for school. Now break out some great books and read to your kids. No need to go crazy, a few minutes a day is all it takes. Agreed! As a former teacher I can't even begin to express the importance of reading with your children. None of The Dudes could actually read before they went to preschool, but they were are very familiar with print! I used to read to my daughter all the time, particularly at bedtime (one more book, pleeeeeeeease mommy??) but I have to admit that's kind of gone down since having baby number 2. We need to get back into that routine. Reading to your children is SO important, and really, it doesn't take much time or effort. Such great advice! Getting kids excited about reading is very good. As a former teacher, the kids that loved to read usually were read to by their parents.